Sit back and simply think of one thing; the most beautiful painting of a sunset dinner-on-the-beach complete with boats slowly gliding along and musicians playing from their souls. Now jump into the painting, you have just arrived at Jimbaran Beach, Bali, Indonesia. And, if you close your eyes for a moment, you’ll be swept to a magical place few have experienced. We believe the people of Bali are special. And they take great pride in their country and customs. Remember to respect this as you make your way around the beaches in Bali and eateries. They think one way, maybe you have your own thoughts. 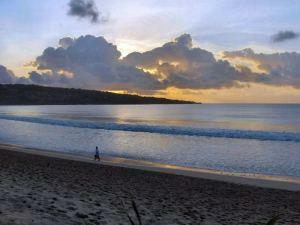 South of the international airport, Jimbaran Beach is safely nestled in between that and Kedonganan Beach to the south. 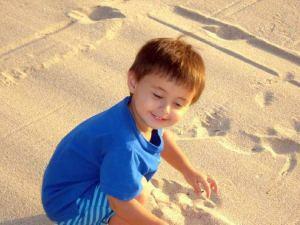 Jimbaran Beach is an extremely tranquil beach and perfectly white. Walking or just sitting and waiting for the sunset are two of the most popular activities to do on this beach. The popularity of Jimbaran Beach has arisen significantly with the appearance of more and more luxury and five-star hotels beachside. Now everyone seems to know about this little once forgotten beach. 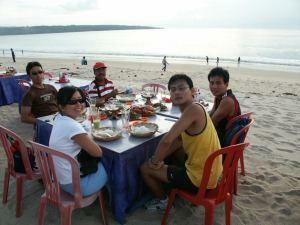 The dining spots in Jimbaran Beach are famous for serving delicious sea food with local recipes. Western cuisine is also available in the restaurants. A must is a sunset dinner along one of the many delicious cafes offering the freshest seafood around, lining Jimbaran beach. The breeze from the ocean and the sound of the waves are enhance your total dining experience. Along the beach there are many opportunities to dine out. Many of the local peoples have opened up various cafes for passersby and tourists. This is very popular because of the enormous selection of seafood that they offer. This, coupled with their special seafood recipes, or even Indonesian recipes mixed with western culture, make for an exquisite dining experience. The fish are supplied by local fishermen who sell their fish pretty much all day long. With the sunset coming up on Jimbaran Beach you may start to see the sky change beautiful shades of orange, yellow, and red. 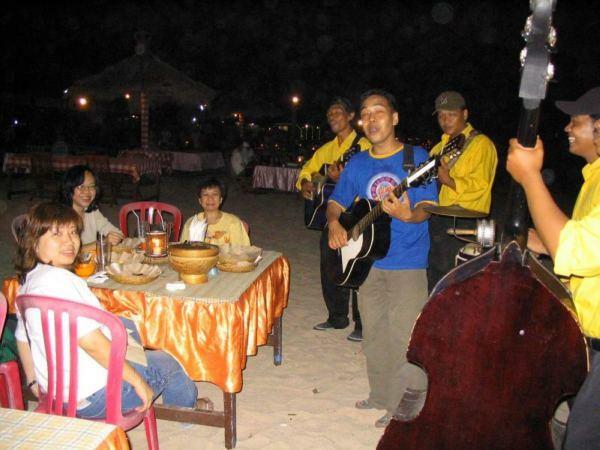 This is usually when the cafes start to put out their dinner chairs onto the sand overlooking the beach, and all of the action on the beach starts to subside while everything else begins to focus on the cafes. The locals like to set a romantic mood for the evening so the whip out some fancy candles and musicians begin to play soothing music. It is quite a sight to see. Once the jukungs begin to fill up the coast line is when things start getting really beautiful and picturesque here in Indonesia. The calmness of the waters makes Jimbaran a perfect place for swimming. Gentle tides, dramatic sunsets, fine seafood restaurants. No water sports available on the beach although some may be arranged with the hotels that provide equipment and boats for snorkeling trips and sea canoe excursions. And don’t leave home without checking out hotel rates. Better deals can be made by sealing the deal in advance. • Facilities – Plenty around the hotels and cafes. • Sports – No water sports available unless arranged by hotels.